This has been a very VERY cold winter in central New York (as of this writing, it looks like we're going to go the entire month of February without once making it above freezing), so I did the only sensible thing: I sold the house & bought a condo in Vegas. Kidding! I dug out some soft yarn, found a pattern for an infinity scarf, and cast it on. I don't get to knit enough these days. My preferred knitting time is while watching TV, and since I don't do that anymore, knitting has been in short supply for quite a while. But this pattern was very simple - a knit 3, purl 3 repeat that alternated every few rows. It also called for three different colors of yarn, which are used and then dropped at regular points in the pattern. Aha, I thought. I could do this while supervising Tsarina's homework. Piece of cake. I have made every possible kind of mistake in this thing, and I am only ten rows in. The yarn is very soft but also very fuzzy. And splitty. I end every row with either too many stitches or too few. That k3 p3 pattern has never yet worked out. If the designer saw what I am doing to her beautiful vision, she would rip the circular needles from the scarf and use them to strangle me. And she would be totally justified. And yet, despite the dropped stitches and the un-repeated repeats, I find myself rather liking this mess. 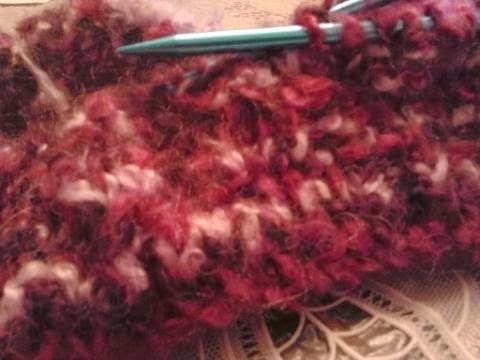 The fuzziness that makes the yarn so hard to work with also covers a multitude of mistakes. The variations in the colors are combining in a way that makes me grin in anticipation. 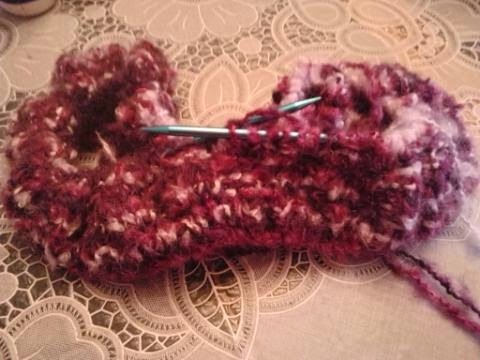 Despite all my screw-ups, the scarf is turning out to be warm and soft and inviting. Even after I make the changes she recommends, I know there are still major mistakes and plot holes big enough to swallow all the Doritos consumed during football season. But at that point, I can deal. Why? Because by the time we get to that stage of the writing, the characters have come to life for me. I know what they would say and how they would sound when they say it. I know how they move and what makes them cry and why they can't say the words I love you even though they feel it in every fiber of their being. They are real, living and breathing inside me, and because they are I can forget everything I first thought should happen and focus on what these people would do in these situations. The conflicts and secrets and subplots aren't coming from me anymore. They're coming from the characters. And because they come from the characters - flawed and splitty and ragged though they might be - they will carry the story over my mistakes and make it ring true. At least, I hope that's what happens :-). So now that I've revealed my knitting and plotting challenges, it's your turn. Are there any areas where you rely on fuzzy yarn (or the equivalent) to carry you through your mistakes? In cooking? Cleaning? Skydiving? Fuzzy yarn is forgiving. A fun post thank you. I wish fuzzy yarn would cover up my housework mistakes but only elbow grease will do that. I haven't done any knitting lately but I did do some crochet projects. Fuzzy yarn covers mistakes in them as well. I have a couple of cats so I find it easier to crochet with their "help" than to knit.